Nowadays, there are many creative ways to make money on the Internet. If you like listening to the music, you should learn how to earn money online just by sitting in front of your computer, listening to new songs. In this article you will discover how to make easy money on the Internet this way. Music Xray is an online platform for musicians, fans and industry professionals. The website helps musicians and bands to connect with the music industry by means of music deals and licensing opportunities for movies, TV, games, advertising, online videos, etc. There are also opportunities to find a manager or publisher, deals for coaching, music critiques, radio plays and much more. As a music fan, you can discover great new bands and make easy money online by listening to their music. Music Xray´s reward for listening to songs starts at 0,10$ per song. After registering as a music fan and connecting your Music Xray account to your Facebook account, they start sending you songs depending on your music preferences you set up in your Fan Mach profile. When you find a song in your inbox, you must listen to it for at least 30 seconds, then you can become a fan of the band, send them a tip (if you really like the song), or just continue to another one. Songs are coming slowly at the beginning, but the more songs you hear, the more you get. You can make the most of Music Xray using its affiliate system, by inviting your friends or contacts who are musicians to register. You will receive a 15% of what your affiliates spend on the website. To do so, just use your affiliate link and invite people to join Music Xray by email, Facebook, Twitter or any other social network. Note: Based on my own experience, the affiliate system counts both fans and musician affiliate accounts. However, you can only earn commissions from artists who submit music to Music Xray opportunities. That´s why it´s so important to invite only people who make music if you want to earn affiliate commissions. Use these simple music xray tips and tricks to make the most of the site. 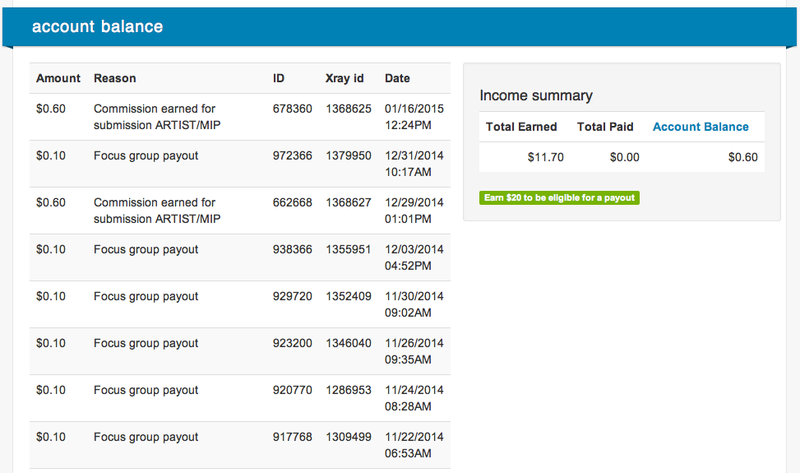 CLICK HERE to register on Music Xray and start making money! If you are a musician, you should sign up for an artist account. You´ll be able to submit your music for licensing, publishing or management opportunities and you can still use Fan Match and earn some money by listening to the music of other registered artists. With your artist account you can also use the affiliate system to earn commissions from your affiliates. 1.6 CLICK HERE to register on Music Xray and start making money! 1.7 Are you a musician?